Given that my experience with murder mysteries is pretty much limited to Agatha Christie, I wasn't really sure what to expect with 'Chocolate Chip Cookie Murder. 'The style was nothing like a Christie novel, but that was okay. It was just different - definitely lighter and less serious. Maybe the target audience was a bit older than myself, but I still enjoyed the book. 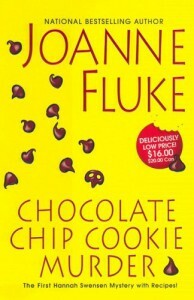 Although, I could absolutely see my mom liking this author's style of writing.Basic premise revolves around a self-employed baker that gets nosy when someone she knows is murdered outside of her bakery, so she sets off to track down the killer.I liked the book just fine, but might try some cozy mysteries from other authors before coming back to this series.